1. The current situation in the Far East has led me to a re-study of our Joint Army and Navy War Plan - Orange. I have long held grave doubts as to its wisdom. I am now convinced that it is unsound. Inasmuch as there is a possibility that at any time in the immediate future we may become involved in the Far East, it is imperative that I bring my views to your attention. a. In brief the plan, making no allowance for the circumstances attending the war or for the influence of enemy action, projects in an inflexible manner a series of successive offensive operations across the front of the enemy to a position on his remote flank - a position seven thousand miles from our West Coast, which leaves the enemy interposed between that Coast and our main forces. b. 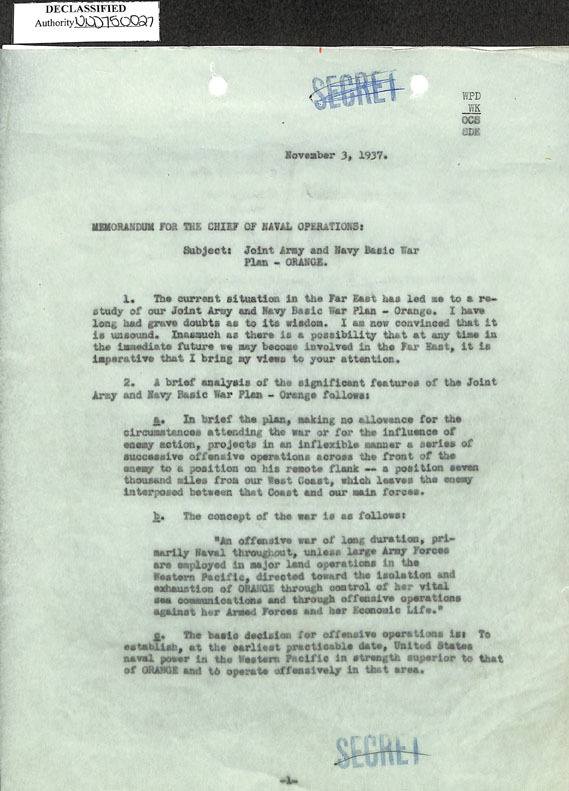 The concept of war is as follows: "An offensive war of long duration, primarily Naval throughout, unless large Army Forces are employed in major land operations in the Western Pacific, directed toward the isolation and exhaustion of ORANGE through control of her vital sea communications and through offensive operations against her Armed Forces and her economic life." c. The basic decision for offensive operations is: To establish at the earliest practical date, United States naval power in the Western Pacific in strength superior to that of ORANGE and to operate offensively in that area. (1) The ejection of ORANGE forces from the Marshall and Caroline Islands. (2) The movement to the Western Pacific of a combined naval and military expedition at the earliest practicable date. (3) The establishment of a Main Outlying Advanced Fleet Base in the Western Pacific. e. While the plan provides that Presidential authorization shall be obtained to start the initial combined trans-Pacific movement of the United States Fleet and supporting Expeditionary Forces to the westward of the Hawaiian Islands it also proves that the expeditionary forces shall be available and ready for departure from West Coast ports on 13M, 21M, 46M, and on later dates. Any one of which might have a material bearing on the course of action the United States should adopt. 4. The international situation is changing with kaleidoscopic rapidity. No one can predict today what the alignments in Europe and Asia will be tomorrow, nor can we forecast what effect these changes will have on the military operations of ORANGE. Yet the plan, disregarding these considerations, projects a series of detailed successive operations far into the future and into a theater thousands of miles distant from continental United States. It is unreasonable to expect that these offensive operations would be carried out except under the general assumptions and conditions set forth in the plan. 5. Once embarked upon the present plan we will be committed to a maximum war effort-one that may and probably will strain to the utmost the resources of the United States. That strain would be justified only if our vital interests are at stake. It is highly unlikely that the present situation in the Far East will so evolve that if we do intervene with armed force, our intervention will be of the magnitude and exact character contemplated by the present plan. 6. The plan is conceived on the basis of an unlimited employment of industrial resources, man-power, and an unlimited expenditure of funds, all directed toward the conduct of an "offensive war of long duration, primarily Naval throughout." Under this concept, practically the entire resources of the country would be committed to the support of very distant, very risky offensive operations that are primarily Naval, without due regard to the fact that such offensive operations may not suffice, or may even fail. Furthermore, the wisdom of allotting so much of our limited Regular Army, especially anti-aircraft artillery units, and units of the GHQ Air Force, to support such an offensive in a distant theater, before similar units are organized, trained, and equipped to replace them in the United States, is open to serious question. Should the offensive fail, or should some other unforeseen contingency arise requiring the early use of anti-aircraft artillery units and combat aviation, the security of United States territory might be seriously jeopardized by reason of the fact that such a large proportion of these units had been diverted to expeditionary forces. 7. 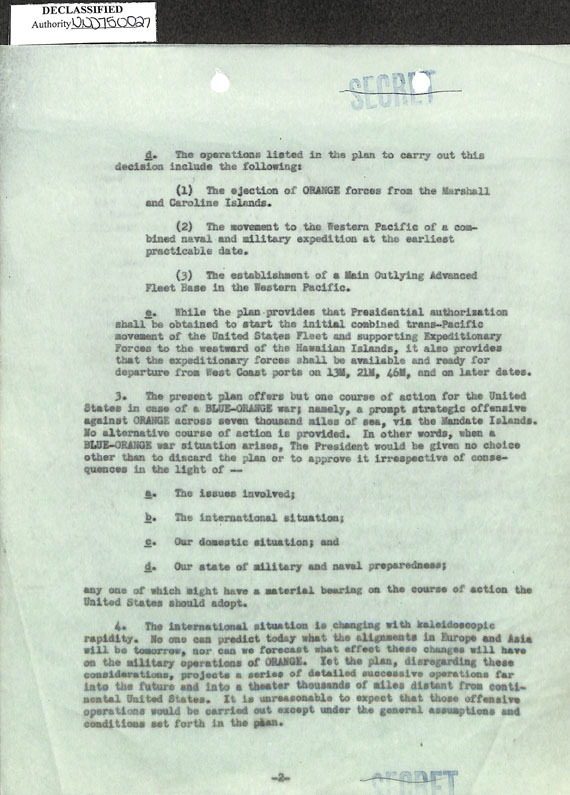 The concept of the plan (paragraph 2. (b) above) implies that it will be found practicable to employ large land forces in the Western Pacific. Military opinion is substantially unanimous in the belief that under present conditions such operation will be impracticable. a. It offers a single course of action only, without any alternative whatever. b. Its avowed purpose is to bring ORANGE to her knees primarily by naval action, in spite of the fact that history does not record a single instance of any first-class military naval power having ever been subdued primarily by such action. (3) The consequences of a possible defeat. 9. In view of the foregoing, it is urgently recommended that the Joint Army and Navy Basic War Plan ORANGE be radically revised so as to all composed by the Chief of Staff . . . .